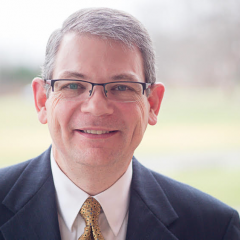 Rhett Dodson is the senior pastor of Grace Presbyterian Church and is married to Theresa. Rhett and Theresa came to Grace Church in July 2010. Prior to that he served as an associate pastor and seminary professor. Rhett became a Christian when he was a teenager. Following this he went on to study at Bob Jones University and earned a B.A. and M.A. in Bible and a Ph.D. in Old Testament Interpretation. His dissertation was entitled Discerning Truths of Holiness: The Theology and Message of Leviticus 11-15. He also studied apologetics at Westminster Theological Seminary. Pastor Dodson is the author of several books and is currently a PhD external student at Theologische Universiteit Kampen, The Netherlands researching the Pauline concept of inheritance.